Nothing freshens up a home like a houseplant. Not only are houseplants perfect for adding a pop of color to a room, plants purify air, help sharpen your focus and help you breathe better. Jon VanZile, author of HOUSEPLANTS FOR A HEALTHY HOME, shares two common and easy-to-grow houseplants to brighten up any space. Long, arching, and somewhat brittle fronds with small alternate leaflets along the midrib. Fronds will grow up to 3′ long. Among the oldest plants on the planet, ferns are prized for their ability to remove airborne pollutants, especially formaldehyde, xylene, and toluene. These common industrial toxins are found in household cleaners and manufactured furniture, and can lead to health issues such as headaches, trouble breathing, and the growth of cancerous cells. 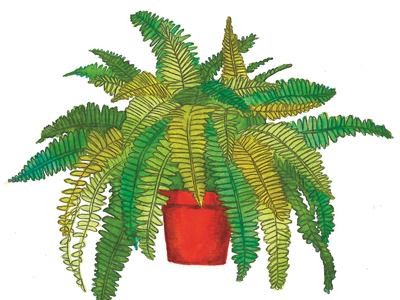 The Boston fern is also good at raising indoor humidity, which can help soothe dry and wintry nasal passages. LIGHT: Indirect sunlight is ideal. Some morning or early evening direct sunlight is okay. WATER: Water weekly and mist daily. TEMPERATURE: Ideal temperatures are between 65°F and 75°F. TIPS: Boston ferns are among the most common indoor ferns, partly because they aren’t as tricky to take care of as some other fern species. They grow particularly well as hanging plants or when placed on decorative columns. During the summer growing season, they respond well to weekly applications of a liquid fertilizer. The plants don’t mind being pot-bound, so you should repot only once every other year. Divide the plant during repotting. Dark green, heart-shaped leaves contrasting with deep red spathes and white or yellow flowers (spadices). Grows to a maximum of 2′ tall, with leaves reaching 12″ in length. The flamingo lily is a common decorative plant that does secret double duty as an air filter. These tropical aroids use their bright green, glossy leaves to remove industrial pollutants like xylene, formaldehyde, and ammonia from the indoor environment. Xylene, formaldehyde, and ammonia are found in manufactured goods such as furniture, and they aggravate the respiratory system and may increase the risk of cancer. Flamingo lilies are excellent when grouped with other air-purifying tropical plants, such as Philodendron species or the peace lily (a species of Spathiphyllum). Additionally, the more plants you have, the more oxygen they release into your home. Be careful: you should never ingest any part of a flamingo lily, as it contains calcium oxalate crystals, which are a major irritant for soft tissues. LIGHT: Bright, indirect sunlight is best; avoid direct sunlight. WATER: Keep continuously moist and mist daily to maintain humidity. Leaf browning is a sign of low humidity or inadequate water. TEMPERATURE: Keep in a warm, humid room, at a minimum of 70°F. TIPS: A well-grown flamingo lily will flower intermittently all year, providing a virtually nonstop display of its striking spathe/spadix combination. Keep it slightly pot-bound for best results, and repot into a fresh peat-based soil mix annually. Do you want to Feng Shui your home? Our editor found some great tips. Excerpted from Houseplants For a Healthy Home by Jon VanZile. Copyright © 2018 by Jon VanZile. Used by permission of the publisher. All rights reserved. 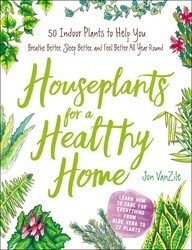 This A-to-Z guide illuminates the numerous health benefits of 50 common, easy-to-grow houseplants along with detailed care instructions and beautiful illustrations of each plant.With plant-scaped rooms popping up all over Pinterest, style blogs, and home décor magazines, houseplants are the hottest home accessory right now—and for good reason. Plants are a quick and easy way to add life, color, and texture to any indoor space. But houseplants offer so much more than just visual interest to a room. They can purify the air, reduce stress, improve sleep—and much more! Houseplants for a Healthy Home explains the specific health and wellness benefits of 50 common, easy-to-grow, and popular houseplants, while introducing you to new favorites bound to brighten your life. 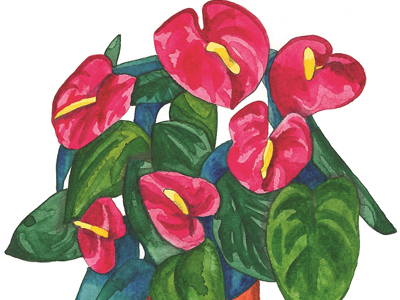 You will find an A-to-Z guide of a variety of the plants that includes a beautiful illustration of each plant, along with the plant’s health benefits and clear, detailed care instructions. 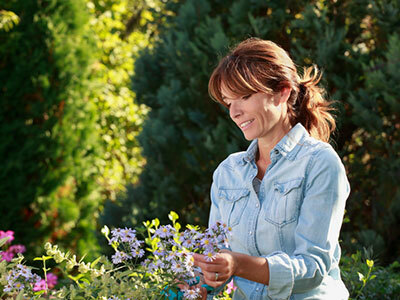 Let Houseplants for a Healthy Home lead you to a life in full bloom.